It used to be that setting up technology for your business involved getting a phone, fax line, a computer, and a couple of software applications. Now, technology involves finding online solutions that make your business processes easier and make your business look professional. Finding the appropriate technology for your business can be overwhelming because it is always changing, there are endless options, and implementing new technology can involve a frustrating learning curve. Even though it can be overwhelming, no one can avoid technology and stay in business. Fortunately, solutions are becoming easier to implement, with most just involving a download or adding a few lines of code to your website. In the buttons above you will find the basic technology that every business should consider. We do not recommend specific products, because what is "best" depends on the needs of your business. Also, the choices expand daily as new products and services are developed. Do an annual search. 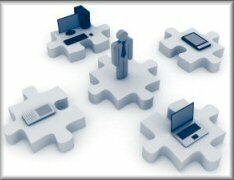 Every business should do an annual search for improved technology for their business processes. To do this, list all the processes that you do in your business. Then do a search on the Internet for everything on your list to see your options.